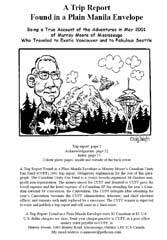 A Trip Report Found in a Plain Manila Envelope is Murray Moore's Canadian Unity Fan Fund (CUFF) 2001 trip report. Obligatory explanation for the rest of this paragraph. The Canadian Unity Fan Fund is a. (very) loosely-organized SF-fandom nonprofit non-organization. The money raised for CUFF and donated to CUFF pays the travel expense and the hotel expense of a. Canadian SF fan attending the year's Canadian national SF convention, the Canvention. The CUFF delegate after attending the year's Canvention becomes the CUFF administrator, treasurer, and chief electoral officer, and remains such until replaced by a. successor. The CUFF winner is expected to write and publish a. trip report and sell same as a fluid-raiser.